Something is missing at United –What Manchester United side under Sir Alex would have ever nearly thrown away a 3-0 nil lead? Yeah, you can argue City are world class but this is the same manager that orchestrated the famous comeback in the Champions League against Bayern Munich. The Old Trafford reality is catching up with Jones –Phil Jones is currently in a torrid run of personal form. With the own goal against Newcastle as well as a couple of bad games before, the Englishman can now add this thriller to one of his worst games. The centre half had been receiving plaudits left right and centre since his big money to United, and quite rightly so, however the defenders form as of late has been shaky, unreliable and costly. Whether it be the adrenaline coming to an end after his move or we are just seeing the real Phil Jones, either way these performances most stop being a regular thing if he is to reach his potential. Lack of leaders at City – 1-0 down and a man down after twelve minutes against your fiercest rivals in arguably the world of football’s most prestigious cup competition should rile up any footballer. However without the commanding presence of Yaya Toure and even the often criticised Gareth Barry; City, for all their world class skill didn’t have that leader, that captain to steady the ship…it could be a long month for City without Yaya. Defence really is the best form of attack – At half time Roberto Mancini took off Adam Johnson and David Silva for Stefan Savic and Pablo Zabaleta to avoid ending up on the wrong side of 6-1 but in the end they probably were unlucky not to earn at least a replay, something that at half time, seemed more unlikely than a Martin O’Neill wearing a suit. Chris Foy is a United fan – He has to be. He helped Stoke beat title rival Tottenham Hotspur and now he has sent off Vincent Kompany for a tackle that would have got a “take a bow son” off Andy Gray against the Red Devils greatest rivals. Fergie really has worked his magic in the transfer market by securing the signings of Howard Webb and Foy in the middle of the park. 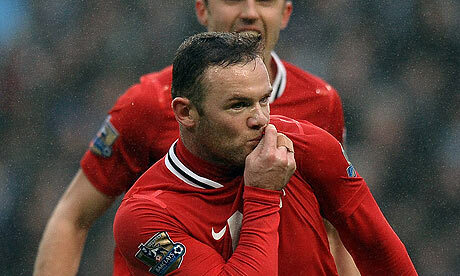 Rooney will 110% be leaving United – He kissed the badge. He’s off. Fact.